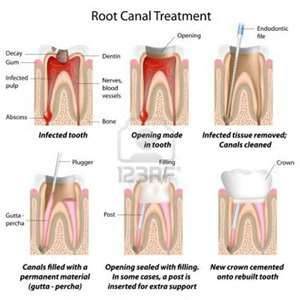 Root canal therapy is treatment used to repair and save a tooth that has been infected due to a deep cavity or cracked tooth. The treatment involves removing the pulp or the nerves of the tooth, and cleaning the infected area. A tooth's pulp/nerve is not vital to a tooth's health and function after the tooth has fully emerged from the gums. If the treatment is not performed, pus builds up at the root tip and the infection of the pulp can spread to the surrounding bone. This results in pain and swelling, and your tooth would likely have to be removed.